Herding dog, guard dog, police dog. The giant schnauzer has served man in many different roles for more than 300 years. Originally developed in the Bavaria and Württemberg states of Germany during the 17th Century, giant schnauzers worked with German shepherds to guard and drive livestock en route to market. As the all-purpose farm dog was brought into cities, their duties shifted from guarding livestock and farmhouses to serving as watchdog in factories, breweries and stockyards, among other places. The giant schnauzer remained a relatively local dog, being employed in the two German states most notably, until just before World War I. At that point in time, the intelligent and physical breed was then called upon for use as a military and police dog. In the United States, giant schnauzers were first imported in the 1930s by enthusiasts, but didn’t begin to rise in popularity until the 1960s and peaked in the 1980s. 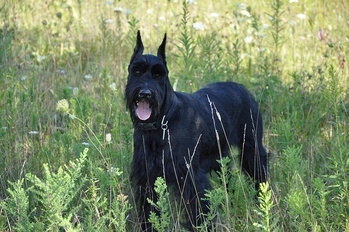 The name “giant schnauzer” doesn’t refer to its size in comparison to other giant breeds of dogs like the great Dane or St. Bernard, but rather its size in relation to the other two types of schnauzer – the standard and miniature. Compared to the standard (25 to 50 pounds; 20 inches maximum height) and miniature (11 to 18 pounds; 14 inches maximum height), the largest of the three really is a giant (75 to 95 pounds; 27.5 inches maximum height). Both the giant and miniature are believed to have originated from the older standard variation. The giant breed is believed to have influences from black great Danes and the Bouvier des Flandres, among others. Like the other two schnauzer breeds, the giant strain maintains the typical schnauzer beard and eyebrows – and ideally has a darker face mask that harmonizes with the rest of the coat color. As with the standard breed, giant schnauzers come in two colors: salt and pepper – which is mix of black, white and gray hairs that give a fairly uniform gray coloring – and all black. While they don’t shed as prodigiously as some breeds, giant schnauzers do require regular care and brushing. If you want to maintain that typical schnauzer look with beard, mustache and eyebrows, regular trips to the groomer for clipping will be necessary, too. As a larger breed, the giant schnauzer has a shorter life span, typically between 7 and 10 years of age. They are susceptible to hip and elbow dysplasia, and eye problems such as glaucoma, cataracts, multifocal retinal dysplasia and progressive retinal atrophy. Cancer and alopecia are other common issues for giant schnauzers, along with hypothyroidism, narcolepsy and seizures. Lymphoma, liver cancer, heart attacks and heart failure are the most common causes of death for the breed. At Paw Print Genetics, we offer a giant schnauzer panel that screens for five genetic mutations, including alopecia, coagulation factor VII deficiency, hyperuricosuria, neuroaxonal dystrophy and progressive retinal atrophy – PRCD. If you order a panel test for all five diseases by Oct. 13, 2013, you can receive 15-percent off the cost of the order by using the code “FBSCH” at checkout.